Do You See Strengths In Your Team-mates? I am a big believer in the concepts of working and building upon strengths; instead of only working upon my weaknesses. It works for me each time, and helps me become stronger and better. In one of my earlier blogs, ‘Do You Work on Your Strengths?’, I have written on this piece and many of my readers agreed with me. As a leader of a team, I have always tried building and nurturing a heterogeneous team – no two people are alike! I keep a close eye on their strengths; what they are good at. It helps me more than merely focusing on each individual’s weak areas. It also helps me channelize capabilities where they fit and deliver best. It also enables me improve the teamwork and it’s productivity every day. It is one of the building blocks that, according to me, makes a team ‘work’. Let me explain it a different way. I meet a lot of people manager, leaders and leadership-aspirants, who keep talking about being inspirational to their teams. They try achieving this by putting forth the length & breadth of their own experience & domain-expertise. They also try resorting to the ubiquitously available, off-the-shelf, motivational tools; sometimes provided by the human resources function. As a talent management person, I find this quite interesting. Inspirational leadership, which has been a talk of the town for some good time now, denotes something else to me. Accordingly to me, a truly motivating leader is one who has an eye and willingness to observe the best in each individual and recognize & work on their strengths. I didn’t enumerate these qualities and strengths in a jiffy; these are drawn upon from my detailed diary notes, which were based upon my interactions, experiences and above all, my observations of each one of my teammates in last 12 months. 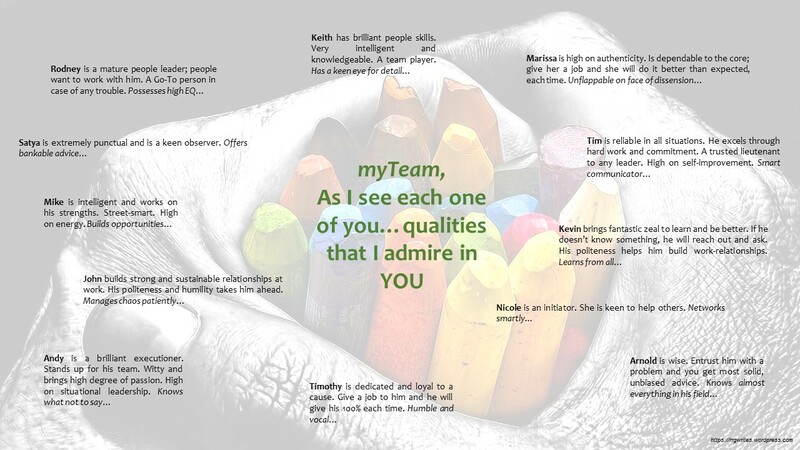 I admire these and find them inspirational… And it was important for me to share what I think with the team – not only to recognize the good, but also to make each individual appreciate the strengths of each other and leverage them. Do you too work on your team’s strengths? How To Lose Your Recently Hired Top Talent? You have hired top talent? Want to build a star team? But, what if you lose them soon? You and/or the Company do not treat them with respect. By respect, I don’t mean you are supposed to bow down to them everyday! But surely, if you do not value their talent, capabilities and experience, they will get disoriented after a point in time and become disengaged. Not giving autonomy as desired or assured, quagmiring them in bureaucratic hurdles, not involving them in key decisions or simply not keeping them duly informed about the crucial events, activities and/or plans – it will send a signal that you or your organization do not know how to utilize such talent. Well, that’s the start, of losing them! You put them under a weak boss. Now, that’s surely a killer. A weak boss is one who is definite recipe for a sooner-than-later-disengaged and fast-disappearing top talent. No one wants to work with a manager who wants to please everyone, doesn’t take a call, appears either lost or struggling, and doesn’t stand up for his people. Plus, hiring top talent is easy, keeping such a bunch of individuals engaged as a team is a far bigger task. A leader has to work double shift in ensuring he is on top of people dynamics, manage conflicting views and yet, do not allow negativity to seep in. Wherever these things don’t exist – top talent too doesn’t exit for long! Too much uncertainty around the goals. If you hear – “Let’s do this as a top priority”, and then find definition of priority changing every month – this talent is surely not going to bear it for long. Top talent, as desired, is often referred to as result-oriented and process driven individuals, who bring a lot of method to the madness – to quote the proverbial management sutra. Yet, shifting goals and priorities aren’t a best way of engaging with them. Moreover, it alienates the teams below too, who find themselves working on difference tasks every other day, without the earlier ideas taking any concrete shape. You and your Company does not listen to them. Another definitive recipe of losing star performers. You hired them for their skills, talent and experience. And yet, you either do not listen to their views, or ignore their ideas. And I am not referring to simply hearing them out. We all would agree that not recognizing the performance and/or efforts is a big derailer for engagement for any employee. However, in my experience, not listening to your top talent is a bigger trouble-maker. When such talent sees little patience in the organization to listen to an outsider’s view or an expert’s opinion or worse, even ridicule their thoughts… be prepared for a replacement hiring soon! As an HR professional, I meet a lot of people on a daily basis; I listen to them, understand their challenges, and sometimes, I just meet them to give them an opportunity to talk freely. I meet people who have recently joined, people who have spent six months or less and people who have spent decades. I meet them all! Yet, my most important leanings have come from my interactions with employees who leave within 6-12 months of joining the company. A great boss I worked with taught me a wonderful lesson – “an employee’s emotions are purest on two occasions – firstly, when he joins the company and then again, when he is about to leave it.” Such employees teach me a lot, really! Above 5 pointers rank amongst the top reasons when I see star performers, who have recently joined, become disengaged and leave the organization. Same can be said of the top talent that was moved to new or higher roles and do not find it engaging. That is my experience and I have found it helpful to manage the newly inducted top talent; I just watch out for the above five gaps. Do share yours. Is there something you would want to add to the list? Almost everyday, we hear the phrase – ‘performance-improvement plan’ or PIP, as it is famously, or rather infamously, known as. This is a scary word, most of the times, for the employee in question. And if we are talking about an employee who is either new to the company or role, and is not found doing as well as it was envisaged, the phrase becomes all the more grave – again for the employee, i.e.. But what about the role that the supervisor need to play in making this employee successful? Aren’t her stakes as high as the employee himself? And more importantly, what is the role the senior leader(s) play in this entire episode? Because for them, the task is two-pronged – one, to ensure fair chance be given to the employee in question, and two, to make the supervisor and other seniors in the hierarchy learn to deal with this crucial leadership challenge, thereby in the process making them better leaders… and the team-leader has to tread this double-edged sword without losing the sight of organisational goals of result-orientation and productivity. Some challenge, this is! I have faced this challenge many times in my career as a HR leader. And experience has taught me one thing – there is no shirking of responsibility that can happen, if the leader really wants to make his team successful, in all aspects. A long discussion ensued in my office. For my readers, I am sharing a note that I wrote to this manager, outlining my thoughts and an action plan. Mr.RST – the employee whose performance is being discussed. Yesterday, we discussed at length the performance & aptitude challenge that we are currently managing with RST. I heard both you and JKL, and shared my thoughts too. I am writing my notes, as under, to encapsulate my thoughts on this critical leadership challenge that we have on hand. I have always firmly believed in the gospel of ‘making everyone successful.’ Having said that, to do so is indeed a daunting task for a leader; for multifaceted as the team is, no one ever seems to behave & perform like the other! Out of the lot, the toughest ones to manage are those, who showed a lot of promise & capability while being inducted into the job, but have slipped off the performance charts somewhere. Now, it requires meticulous thought and concerted action, to bring such team-mate back to where he belongs – road to success for self and team. Firstly, let me thank both you and JKL for showing commitment towards your team-mate’s development. This is by no means a small act – requires a lot of honesty and courage to stand up and say, “Hey! My team needs to do better, and I am game to make them better, whatever it takes.” Thank you, for recognizing the need for improvement and showing the promise to do better. Our first step with such a below-expectation performer is to figure out what went wrong. Something did go wrong. Nearly all employees start their new job with positivity, enthusiasm and are raring to go – we all know RST did start like that. Maybe, something along the way diminished his enthusiasm. Or, he killed his own enthusiasm; both are possible in the workplace. Ascertaining the primal cause of this poor performance is the key if you are committed to help teammates like him become, not a poor performer, but a contributing member of our team. No employee decides to have a miserable day at work and feel failure as he leaves the workplace daily. 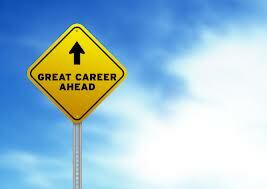 Even an otherwise incompetent or misfit employee wants to do well for himself! Very importantly, you need to ascertain if RST has his intentions right; for, if he is really a work-shirker, there is little hope for improvement. However, you have all hope if he really wants to succeed. That said, whatever conclusion you arrive at about why he is a below-expectation performer, you must try your level best to turn him around. Start by assuring him that you have faith in his ability to succeed. Inspire through showing the big picture – help him see the what fruits his efforts shall bear – why should he strive to succeed and improve. Guide him and make him set several short-term, achievable goals; which should be time-bound, with clear outcomes about which you agree. Once the goals are set, track execution and progress. And don’t forget the power of daily engagement – make sure he gets an opportunity to record small daily wins; that should take care of the morale front. We also discussed yesterday the need of a written performance monitoring document. For those who feel that the team-mate who needs a Performance Improvement Plan (PIP) will never succeed, I have many success stories to offer – we have seen so many of them succeed. In fact, I have used this to my benefit many a times, in making my team successful. So, I am a believer in the power of a well-planned, measurable PIP that is reinforced by well-intentioned and demonstrated support and encouragement provided by the manager. Clearly outline parameters of expected improved performance. Please be objective in setting these parameters and explain clearly, leaving no room for ambiguity. State the minimum expectation level of performance. Ensure there is an appreciation of consistency of this improved performance. This is crucial as sporadic spurts of improvement aren’t really sustainable. Discuss and agree the upon feedback mechanism. Specify the time and periodicity of performance reviews. Set the documentation mechanism of each review stage. Ensure he understands measurements of improvement evaluation. Specify what role you shall play in order to make him successful. Explain upfront if he needs to make any changes in behaviour or attitude towards work. Share examples. Focus on ‘what if’ – clearly outline what is the road ahead if expected performance levels aren’t achieved on every parameter, at various review-stages. With above seven parameters considered, you’d have a robust PIP document ready. With this, ensure you provide any other support, resource, training, et al, which will help him expedite his improvement. Let me say, I’ve always regarded problems as opportunities to do better, gain experience, and learn more, just to be a little bit smarter and perhaps wiser on how to handle life issues and situations. After all, as they say, we learn best, not by being taught and not by studying or reading, but by experiencing and then reflecting on what we did and what happened and then drawing conclusions and experimenting. As a coach, I’ve practiced this method with considerable success; it helped me build and develop stronger teams. I am quite inspired by this leadership nugget that I read long ago – ‘the tactics espoused by great managers of people are very simple, they select people based on talent; when setting expectations for the team, they establish the right outcomes; when motivating an individual, they focus on strengths; and, to develop an individual, find the right job fit for the person.’ As we speak, you are currently managing the second and the third aspect, and what will make you successful is the willingness to make your team successful. I am sure; you have it in you do so. Please do reach out, should you need any support from me. This one’s a bright and promising junior of mine from college, with whom I was exchanging a few emails a while ago. He works for a large Indian IT multinational and had been associated with the company for over seven years now; he joined them right after MBA school. He performed well and consequently, has climbed up the ladder at a speedy and consistent pace. During the conversation, I remarked on his consistent growth within the organization and as his proud senior, expressed my admiration. He responded in measured words. Words of wisdom, I would say; something that young managers don’t speak too often, at least whilst referring to the pivotal cross-linkage that depth of learning has with career-growth. Sharing this with all budding professionals; these are words their worth in gold.